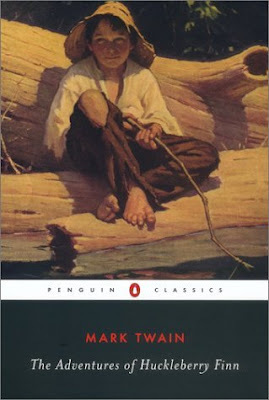 I liked the first person narrative Twain used here much better than the third person of Tom Sawyer. I loved the moral allegory he uses to help us stick with Huck as he journeys through his own soul and learns to see Jim as a real person and not just a piece of property. And Jim's personality compared with the general attitude towards the black slaves at that time shows very clearly how firm Twain stands against racism. I have two gripes, well half-gripes, really. The first is that when Huck shows up coincidentally at Tom's Aunt's house and then Tom comes along himself, well that's a little too uncanny. And then to have Tom mess up all their plans just for the adventure of it when he knows all along that Jim is well and truly free, now that's just tiresome. And the second is the phonetic spelling. Kudos to Mr. Twain for his research into the various regional lingoes and for his attention to authenticity. But you have to admit, he sacrificed the general flow of the story in favor of this sometimes charming characteristic. All in all, it worked out alright, but there were times I could not figure out what they were saying. I'd be hard pressed to say if I liked this or the first one better. But I'd say this one had a more definite moral to it. "...Huck as he journeys through his own soul and learns to see Jim as a real person.."
I remember this element unfolding clearly in the book as I first read them. I wonder how I would feel differently about this book now than I did as young person.